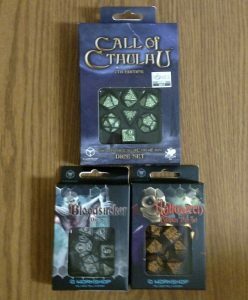 As you can see, I did get some Call of Cthulhu dice for a future review. You can also see the changes in packaging style. The boxes are smaller for their new dice and the days of fitted plastic trays for the dice are now over. The size of the dice remains the same and the change in packaging size only cut down on wasted space. I was admittedly concerned about the dice getting scuffed up since they’re loose in the box, but thankfully that wasn’t the case for any of the dice sets. Part of me wishes they could use some cardboard strips to keep the dice from bumping into each other and another part of me admits that most purchasers will throw them into a dice bag where they could get potentially scuffed anyway. But since they all arrived in perfect condition, I’m not doing to dwell on it. 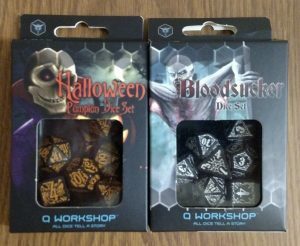 Even Halloween fans who don’t play tabletop RPGs will instantly fall in love with these. I love the use of a candle as the “1,” along with the bats and scary faces which surround the numbers. Replacing certain values on all but the d4 with a grinning Jack O’ Lanterns was another great touch. Given how it was originally designed as a solo effort (and has larger surfaces to work with), the lightly engraved designs look especially wonderful. 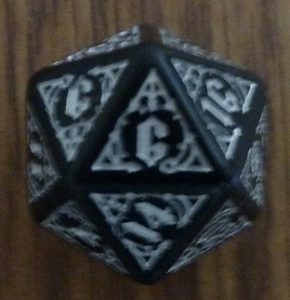 The d6 also has certain aspects that don’t appear on the other dice, such as a side with all bats surrounding a number. The use of a dot to differentiate between the six and the nine was also an appreciated feature on the dice. The dice might be a bit hard to read from across a gaming table, but that might work in your favor if you’re a game master you doesn’t have a screen to game behind. But they’re much easier to read up close. Come to think of it, it could be fun to run an encounter with the Headless Horseman and roll the dice directly at your players without using a screen. If you play the 5th edition of Dungeons & Dragons, you can find the free stats for this legendary character at Kobold Press. I also found Loot The Body’s free Halloween adventure for that edition, Night of Samhain. Wizards of the Coast has both the basic 5E rules and a guide for converting from previous editions of the game available for free. Since Pathfinder is similar to the 3.5th edition of Dungeons & Dragons, you can use Paizo’s “3.5 to Pathfinder” conversion and Wizards of the Coast’s conversion guide (along with the Pathfinder Roleplaying Game Reference Document if you don’t have the game) to make a crude conversion. Or you can just look up one of the many free guides for converting Dungeons & Dragons to Pathfinder. Using these dice in October while playing any RPG (especially a horror one) also works. Given the dice’s inherent coolness, along with the fact their orange and black design looks great under a black light, also opens the door for their use in a homemade haunted house! Visitors could enter a room filled with fake pumpkins. The room should be lit with a black light and the pumpkins should be coated with paint that glows bright orange under such lighting. Located in the middle of the room is a throne which holds a robed figure with a pumpkin for a head. This can either be a mask you purchased or an altered version of one of your fake pumpkins. The figure will beckon your visitors towards them and explain it will use a scrying ceremony to determine their future. After rolling one or more of the dice in a dice tray, it will announce they’re doomed. If the result involves a Jack O’ Lantern, then the figure will chase them out personally. Otherwise, the guests will head towards the exit and get startled by a Jack O’ Lantern popping out from a pile of pumpkins. This can be accomplished either by having a helper wearing one of the pumpkins while sitting in a pile of fakes or by use of a pop-up. Alternately, the pumpkin-headed figure can roam the waiting area while carrying a spooky lantern (one can easily be made using a small painted cardboard box and either electric tea lights or a glow stick). They can carry a dice tray as well and repeat the scrying routine. But this time getting a Jack O’ Lantern result will have the figure give an evil, knowing cackle. Little does the guest know if that there’s someone inside the haunt wearing an identical costume who will catch them by surprise. The duplicate costume trick will happen whether or not the patron has their fortune told, but having a waiting area encounter beforehand does add to the effect. I was originally going to cap off my discussion of the Halloween dice by encouraging readers to help make sure the Kickstarter campaign reached its stretch goal of including a free Halloween dice bag with all sets sent to backers, but it turns out that goal has already been reached! If you’re not able to join in as a backer, you can still purchase one at Q Workshop’s website. But there are still other goals that need to be met and you can help out without spending a single penny! A simple retweet, “like” or joining a Facebook group is all you have to do. I already did my part and hope you do too. The “Bloodsucker Dice Set” was designed by Emil Dera, who provided the box art for both this and the previously reviewed set! Depending on how you interpret the engraved design, it’s either arrows and barbed wire or ornate metalwork with thorny vines. The metallic coloring, which brings mirrors and silver to mind, could hint at the weaknesses suffered by vampires. Which would mean these are dice for those who hunt vampires. 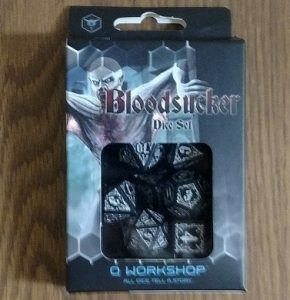 But since there’s a vampire on the box and they’re called “Bloodsucker” dice, the ornate metalwork theory is probably correct. Especially once you factor in the gothic numbering on the dice. I first looked at this die and thought it had two of the same number printed on it by mistake. But closer examination revealed the topmost “six” is the actual six and the other one is the nine. If you like your combat sessions fast and furious, this could potentially throw a monkey wrench into the situation. I wish the design had included something by the numbers to make it easier to tell the two apart. Then again, both of these sets are collector’s items and I imagine those who want dice which are easy to read would probably opt for standard plain dice. It all really depends on what you’re looking for when you buy these. If you want cool conversation pieces, look no further. But let’s get back to the “Bloodsucker” dice. These practically cry out for use with Vampire: The Masquerade, so why not download the latest free rules and Rusted Veins scenario? Depending on your interpretation of the dice, their design could also make them appropriate to use with post apocalyptic, zombie and monster hunting RPGs. The free role-playing game Dark Revelations combines certain elements from those, along with fantasy games. You had better believe vampires are included as well. So read through the Player’s Guide, Book of Adventure, Book of Magic, Book of Progress, Book of Arrogance and the Monster Manual & Book of Danger. It’s a the Hypertext d20 SRD might also be of use. The d6 from either set would be great to use with the free printable board game Grave Digger. I rolled all of the dice from each set rolled several times on a soft surface and didn’t notice any balance issues. The polymer dice didn’t feel overly light. Those seeking to extend the life of their dice should consult the resources I provided in my previous dice review. 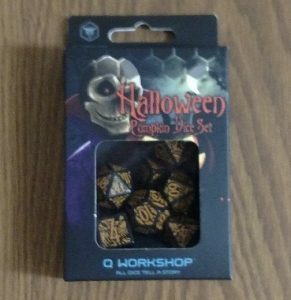 I did like both sets, but the “Halloween Pumpkin Dice” set is my favorite. Fans of the “Bloodsucker Dice Set” should be interested to learn how there is a “Bloodsucker” dice bag, but it’s only available as a Kickstarter bonus as of this writing. Supporting the “Top Drawer Dice” campaign is highly encouraged, especially since there are plenty of stretch goals and the possibility of alternate color schemes for the dice sets. Stay tuned for the Call of Cthulhu dice review, as it will include more ideas and free stuff (including some which can be used with these dice as well)! Special thanks to Q Workshop for the review copies!